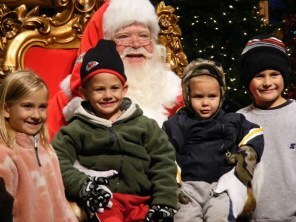 Branson's Christmas Attractions focus on the Christmas season like few in the country do. Whether you are heavy into the Christmas spirit by now or having a problem getting into it, the Christmas attractions in Branson pull you into that spirit in a big way. You don't have to feel your Christmas season is running out of time. Silver Dollar City is even open the week after Christmas. So don't miss out making your Christmas spirit come to life. The park is alive among the 4 million lights that make this a truly magical Christmas destination. 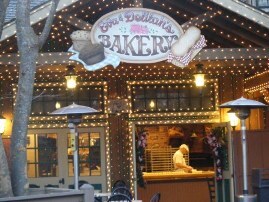 Holiday cheer and Christmas lights begin as you enter the park and smell the holiday aromas wafting through the air from Eva and Delilah's Bakery. This is a necessary stop as you enter into the city. As you enter the town square you are greeted by the 5-story musical Christmas tree twinkling in unison to sounds of the season. Making your way through the streets and into the stores filled with gifts of Christmas cheer you grasp the wonder of the skills of the artisans and craftsman that make this city so unique. Candy makers, glass blowers, blacksmiths and every imaginable art and craft artisan take you on a journey to the past. Beautiful seasonal decor made with the hands of gifted craftsman make special gifts for the season easy to find. Theaters and stages are throughout the city with holiday productions that will stir the imagination and fill you with cheer. Plenty of rides are still open for the kids and adults to top off your visit to the city and it wouldn't be Christmas without a visit to watch the kids with Santa Clause. If food wasn't on your mind when you came, it will be as you make your way through the city. From old time favorites out of Grandma's kitchen to the sweet delicacies offered throughout the park, the aromas will only be the beginning as you give in to the desires to satisfy the taste buds with delightful treats of the season. The choices seem endless as you wander past "Aunt Polly's" as they cook their southern fried chicken or their Ham and beans with cornbread. 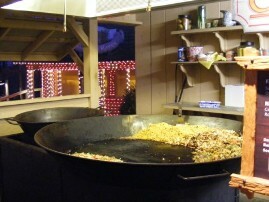 Or try walking past the "Buckshot Skillet Cookery" with their giant skillets of "Family Fued Succotash or the "Harvest Skillet". The "Riverside Ribhouse" greets you with the smells of their smoked meats and the sweet smells of Hot Apple Dumplings from "Hannah's Ice Cream Factory" enhances the delight of this winter wonderland called Silver Dollar City. The Gifts of Christmas Holiday Light Parade winds through the streets of the city twice each evening and is a treat for young and old. 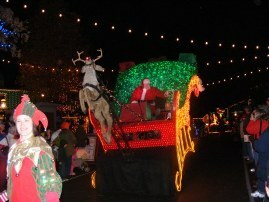 Holiday floats and characters highlighted among the 100,000 lights of the parade set the stage for Jolly Ol' St. Nick as he travels in his traditional place at the rear of the parade. The kids are going to love it. Silver Dollar City is a Christmas Attraction you don't want to miss. Make it a family tradition. Celebrate an old time Christmas with a Chuckwagon Cowboy Supper at Shepherd of the Hills. This is a Christmas memory your family will share for a lifetime. A cowboy Christmas dinner served from a real 1800's chuckwagon is just the beginning as you sing along with cowboy Christmas songs and your favorite Christmas carols, holiday stories and enjoy a time of reflection on the meaning of Christmas.. The Trail of Lights is an animated drive-thru display of different lands each with their own fantasy, religious and patriotic themes. Three-dimensional characters among millions of Christmas lights backed with festive holiday music make this a heart-warming and fun evening. The trail winds 2 ½ miles through the historic 160 acre Shepherd of the Hills Homestead and takes you down the famous "Trail that Nobody Knows How Old" into a enchanting Christmas display. To finish the dazzling light display, a trip up 230 feet to the top of Inspiration Tower in glass elevators to an incredible view of not only the Trail of Lights but of Branson and the Ozark Mountain area. Another Christmas memory from one of the best Christmas locations in America. Where can a child ride a Christmas Magic ride and wear their pajamas? Why, on the Christmas train ride departing out of the 1906 Branson Railroad Depot. This magical round trip journey to the North Pole is where kids can meet Santa, do some caroling and hot cocoa and a treat. This is a special Christmas attraction memory for the kids.